mommy bytes: I Can Haz Crafty! 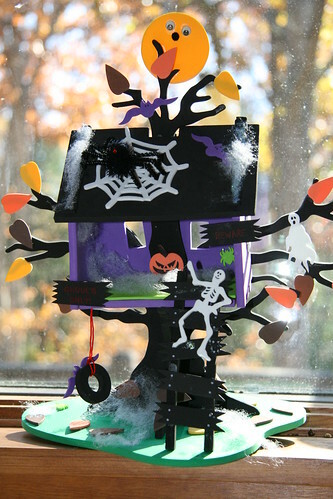 I bought this craft kit for a haunted tree house while I was on one of my business trips, probably out of guilt to make sure that I would spend "quality" time with the kids when I got back. This would have been a great idea except for the fact that I am not crafty at all. Sure, I can knit and cross stitch, but glue? No skillz there. But my kids have had enough training in this sort of thing from school and preschool to help me along. In the beginning, I assembled the house with Dova outside on the deck while Adam buzzed around the yard on his dirt bike (nerve wracking at best - I have only one set of eyes). After Adam joined us, I had to constantly bite my tongue, trying not to yell at their unbridled enthusiasm and spoiling our quality time. It was pretty hard to let go of total control and perfection, but I did let them place most of the doodads. I took ownership of the ladder, the black spider with the red jewel eyes and the rising moon with the face. I think the tree house turned out pretty darned good, as well as the photo, with real fall leaves in the background.